This is kind of an advanced article in the SEO space, so I’m not going to make an attempt to address the little things. If you’re struggling with the details, try to just step back and consider it strategic, even though the strategy itself is data heavy. I remember working with a weight loss company that shall not be named due to how frustrating they were to do business with. This particular company had clinics in cities all across Canada and if you’re Canadian you’d recognize their brand, so we’ll say they’re fairly authoritative. Their website was never very successful and they’d just redesigned it with a minimalist bent. They had a total of five pages on their site. Has the client done anything ridiculous from a Technical SEO standpoint like de-index most of their valuable pages or split their brand into 40 different micro sites? Does the client have a competitive Domain Authority or are they going to struggle until we implement some kind of Authority campaign? Does the client at least have the 20% of the pages that target 80% of their market (AKA their Pareto Pages)? After that we get into the less needle-moving elements of a campaign. Remember that that list is the catastrophe list. If their Technical SEO has major issues, the pages in question will never rank for anything. Search engines just can’t see them. If their Domain Authority is the pits, no matter what kinds of work we do they’ll never rank for anything. If the client hasn’t even built the pages that address the majority of their market, they’ll never be in front of that market. I think the SEO industry does a fairly good job of handling the first two points, but we’re maybe a bit less grounded on the third, and I think the idea of Pareto Pages needs to be top of mind when we’re thinking about SEO. So, What is a Pareto Page? Obviously I’ve stolen the nomenclature from the Pareto Principle, AKA the 80/20 rule where 80% of something is due to 20% of something else. In our case I’m saying 80% of your market demand is addressed by 20% of the pages on your website. You could also say 80% of your traffic comes from 20% of the pages on your website. The reason this is important is because everything in business fits on some form of Effort/Impact scale, and we’d ideally like to be getting the biggest Impact for the lowest Effort. Pareto Pages let us do that. To figure out Pareto Pages, we kind of need to overhaul our thinking about “Keyword Research” and Content in general. We also need to start to understand market demand when it comes to SEO, so we’ll do both of those things at the same time. Let’s give it a shot by getting back to our weight loss clinic example. The traditional definiton of market demand is that it is the aggregate demand of all potential customers in a given period of time for a product or service. For our weight loss clinic, we can decide on a service (weight loss programs through a clinic) and a timeline (let’s say the last 12 months), but how do we figure out demand for that service? A simplistic approach might be to say, “well, how many people are Googling ‘Weight Loss Clinic’?” Let’s say that number is 22,000, which we grab from Google’s Keyword Planner. That number is the average number of potential customers demanding a particular service over a monthly period, so this isn’t a terrible approach. You could kind of use this number to compare apples to apples, like, “are people more interested in Weight Loss Clinics or Real Estate?” (If you’re curious, Real Estate’s number is 3,350,000). But we can get much more explicit. We need to identify whether our weight loss clinic has any market demand in each category. This is a combination of instinct, research and experience. Product: No, they don’t sell any products. Service: Yes, they offer weight loss programs. Industry: No, unfortunately no potential clients seem to define themselves by their industry, e.g. “weight loss for retail employees.” That would be awesome though. Demographic: Potential clients define themselves by medical conditions (weight loss for diabetics), gender (weight loss for men) and age (weight loss for kids or weight loss for seniors). Problem/Process: Kind of. This isn’t as easy as, “my basement is flooded,” which clearly leads to call a plumber. In the weight loss world, terms like “obesity treatment” or “keeping weight off” are more informational queries rather than users in the Bottom of the Funnel AKA at the Purchase stage. We should compete for these ideas but they don’t have nearly the same purchase potential as the other categories. Ignore for this exercise. Competitor: No. 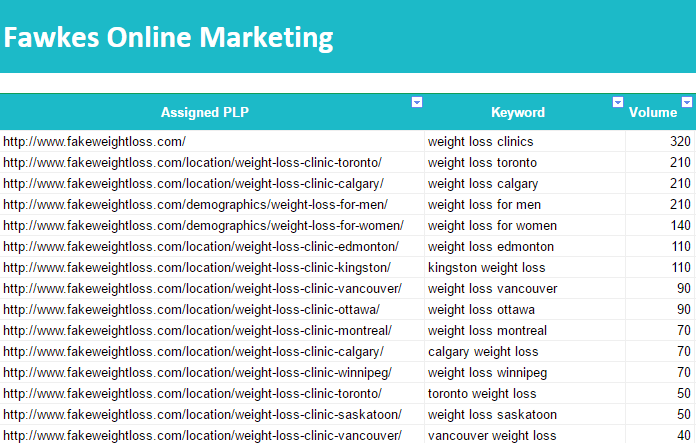 I did a quick search for users comparing big chain weight loss clinics and none of them have search volume. This leaves us with only three categories. You might be drawing some parallels already. “Wouldn’t it make sense,” you ask, “to have a page that directly addresses a specific user need, like ‘Weight Loss for Diabetics’? That would be way more helpful to a user than showing them a generic weight loss page.” Damn straight. If we were to build out the research for these categories, we’d find that there’s only one service which requires only one page (our home page, most likely). Let’s say there are 32 Location pages, each targeting a city with a clinic, e.g. “Weight Loss Clinic in Toronto.” Finally, there are perhaps five Demographic pages around medical conditions, gender and age. Having gone through this process, we can easily figure out which are our Pareto Pages. 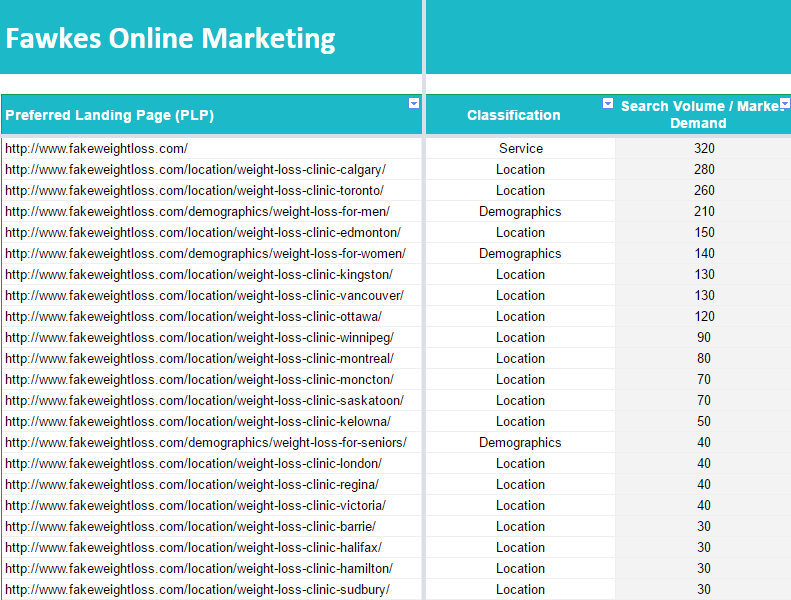 They’re the 20% of our pages that represent 80% of our market demand, which in our case means we should target our Service keyword with our home page, both genders in the Demographics, as well as Calgary, Toronto, Edmonton, Kingston, Vancouver and Ottawa with Location pages. If that’s not done, we’re really messing up. In the future, Location pages will be, by far, our biggest movers and shakers. You’ll note that this type of research is foundational. It’s an amazing framework to build off of as we grow. This method and ideology works for any industry, even if it results in a frustratingly small market demand. Unfortunately that’s how the cookie crumbles sometimes. Just keep in mind that this market demand doesn’t represent your actual traffic; generally a mature search program will hit ten to twenty times this initial volume. Hope that helps, and if you’re interested in working with me leave me an email at [email protected]; I work on a project-based, hourly model which my clients love.